TIP: You can rename the page title and URLs of the login page by going to the Pages section in WP Admin and editing the Client Login page. See Logging In for more information. Once they are logged in they will be redirected to their dashboard. We’ll run through the main dashboard page here. NOTE: This is what the dashboard would look like if the team member has full permissions to Projectopia. Admins are able to configure roles to restrict access to any part of the plugin. Role – The role of the team member. This is set by admin and dictates what the team member has access to. Messages – Accesses the Direct Messages page, see Direct Messages for more information. Notifications – Shows notifications for the team member. See Notifications System for more information. Profile – Allows the team member to access and edit their profile. Admin Menu – Accesses every part of the plugin that the team member has access to. Breadcrumb – Shows hierarchical links to the currently viewed item. The admin dashboard has been designed to give team members an at-a-glance view of what’s going on in all of their work. A regular user with no extra permissions will be able to see the projects that are assigned to them, a table of their tasks, their calendar (via the menu) and a timeline of project updates. Roles can be configured to allow access to other sections such as Invoice and Support Tickets. See Roles & Permissions for more information. Income by Month – This section shows all income by month from invoices generated by the system. It can also show expenses via the Suppliers and Expenses Add-On. This section is available to roles who have access to the invoice system. My Active Projects – This section shows all active projects that are assigned to the team member (or ALL active projects in the case of Projectopia Admin or WP Admin team members). Pending Tasks – This section shows all pending tasks in all projects. Team members can see a more details table of tasks by going to the My Tasks page under the My Work admin menu link. Project Updates – This section shows updates from all active projects including who made the update, which project / task was updated and at what date / time. Pending Quotes / Estimates – this section shows a list of all quotes that have been created but have not yet been accepted. It also shows quotes that have been raised by clients via the use of Quote Forms. This section is only shown to users who have access to the quotes system. 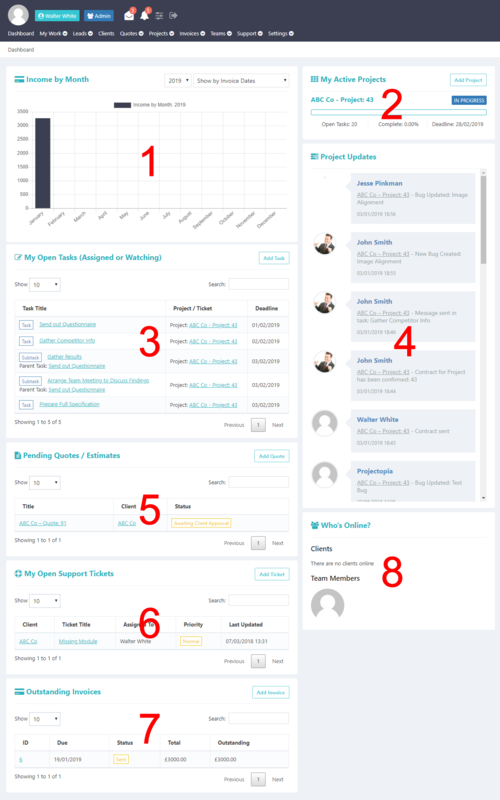 My Open Support Tickets – This section shows all support tickets that are assigned to the logged in team member. It is only available to users who have access to the support ticket system. Outstanding Invoices – This section show all outstanding (unpaid) invoices with a status on whether the invoice is overdue. It is only available to users who have access to the Invoice system. Who’s Online – This widget shows a list of which clients and team members are currently online. Permissions can be granted to view this widget in the Roles & Permissions page.